New cameras make great Holiday gifts and digital SLRs offer the best performance, best image quality, and most versatility of any kind of camera. They aren’t just for pros, either. There are DSLRs for all kinds of photographers, from beginners, to families, to professionals who use their cameras every day. The common elements that all digital SLRs share are interchangeable lenses, large sensors for great image quality, great auto focus performance, and manual controls. Whether you’re shopping for a friend, a loved one – or that most loved one, yourself – there’s a digital SLR in this guide that will fit your needs and budget. We’re starting with Nikon’s new Df purely because it’s the sexiest DSLR you can buy right now. Nikon calls the Df a “modern classic” for “Pure Photography.” The design inspiration for the Df comes from Nikon’s manual film cameras of twenty years ago. The all-metal, manual control dials and the chunky pentaprism housing on top of the camera harken back to the pre-digital age. However, the rear and inside of the Nikon Df is pure 21st century. It has a 3.2-inch LCD display, a 39-point auto focus system, full HD video, and the 16-megapixel full-frame CMOS sensor is the same one Nikon uses in their flagship DSLR, the D4, a camera known for amazing image quality. Sony is the most forward-thinking camera company right now, with the most thoughtful and creative camera designs. They also make a lot of the sensors used in other manufacturers’ DSLRs. The 20-megapixel A58 incorporates some of Sony’s coolest features, including an electronic viewfinder (EVF), built-in image stabilization, a tilting LCD display and their excellent SLT design, which uses a transparent mirror so you get the same auto focus performance for video as well as still photos. And you can buy the Sony Alpha A58 with a lens for under $500! You won’t find a camera with more features and better performance for the same kind of money. The Nikon D5300 pretty much has it all – a state-of-the-art 24-megapixel CMOS sensor, tilt-swivel LCD for shooting and recording video from all angles, and built-in Wi-Fi (watch our digital camera Wi-Fi demo video) so you can share your photos and videos from your Smart Phone. Honestly, the D5300 is nearly the same as its big brother the D7100, but with more features and a price tag that’s hundreds of dollars less. Seems like a no-brainer to me. If image quality is your number one priority then a full-frame DSLR is the answer. The Sony Alpha A99 has the most progressive design and best feature-set of any full-frame camera. The 24-megapixel sensor can be used in the dimmest light, Sony’s transparent mirror design gives you the same auto focus performance for video and still photos, and the built-in image stabilization helps compensate for shaky hands no matter what lens you’re using. It also has an excellent electronic viewfinder (EVF), which means you don’t have to check the LCD to see the histogram or check photos for sharpness. You can also use the EVF when you’re recording video – something that’s impossible with traditional DSLRs that have optical viewfinders. The Canon EOS 70D’s claim to fame is the new “Dual Pixel AF” auto focus system that lets you track a subject in action when you’re recording video, something very few DSLRs can do, let alone do well. It’s more than a one-trick pony, though. The EOS 70D has the same still photo auto focus that its big brother the EOS 7D has, along with 7 FPS high-speed burst, so it’s capable of professional-level action photography. It also has a handy tilt-swivel LCD display and built-in Wi-Fi (watch our digital camera Wi-Fi demo video) so you can share your photos and videos on the spot, with your Smart Phone. 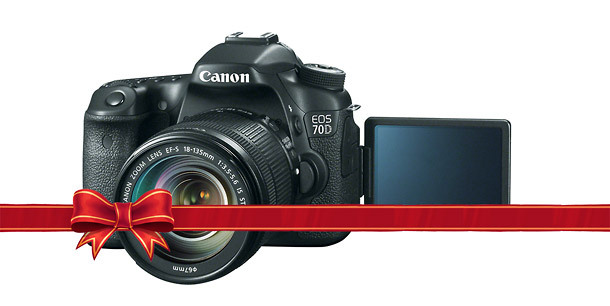 If you’ve got an aspiring action photographer or video maker in your life, the Canon EOS 70D will rock their world. Pentax may be an underdog right now but they actually make some of the best digital SLRs on the market – especially when you factor in price. The Pentax K-50 is no exception. It has a far better build and more high-end features than any other camera at the same price point. The K-50’s fantastic 16-megapixel sensor and built-in image stabilization make the camera great for low-light shooting situations as well as high-speed action photos; and it’s got shooting modes for everyone from complete beginners to seasoned experts. It’s fully dust and weather-sealed, making it an especially good option for outdoor photographers who spend a lot of time in the rain and snow. Pentax even has a custom color program that offers over 120 different body color combinations – even solid black. If money is no object and you want the absolute pinnacle of camera performance, then there’s only one choice – the $7000 Canon EOS-1D X. 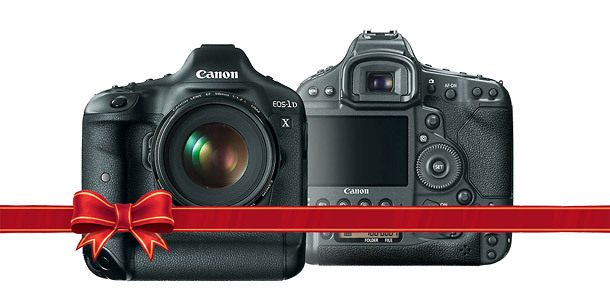 The Canon EOS 1D X is the most expensive DSLR you can buy for a reason. It’s built like a tank, the 18-megapixel full-frame sensor can take pictures in the dark, the 61-point auto focus system is the most advanced you can get, and it can shoot as fast as 14 frames per second. If you’ve ever wondered about the camera behind all those big white lenses at professional sports events – it’s the Canon EOS-1D X.